First, the Super Bowl: how did I miss posting this? I guess because we were getting ready to travel. We are a Broncos family, so as you might expect, we enjoyed the Super Bowl this year. Poor Cute W had to work for the first half, and he was the only one in the family taking it graciously. The rest of us remained in denial. J kept asking, “Does Daddy still, really have to work today?” When we arrived at a party and people asked where he was, I’d remind them that he had to work and more than one person answered, “Oh, my gosh, really? I thought that you were kidding.” He made it in time for the second half. Meanwhile, at home, I was prepping at home with the obligatory Buffalo Chicken Dip and some bonus brownies. Meanwhile, J was checking the clock. It was funny, because all through football season, the girls’ favorite part, hands down, was running to the tv to watch Carrie Underwood sing, and on Super Bowl Sunday we were literally waiting all day for Sunday night. Everyone had fun, and I, for one, really liked the halftime show, and after reading that blog post about Beyoncé and following the virtual breadcrumbs to the analysis of Formation, I totally wished I were in college taking a course in pop culture right now. It made me want to study it all, like the nerdy, nerdy gal that I am. Next, here’s Isis looking at me all irritated and saying, What game are you playing, Katie? That’s because she’s trained me well, and I was not performing correctly. 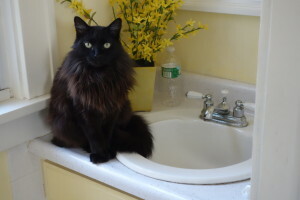 Under normal circumstances, Isis can meow plaintively, give me a significant look, walk to the bathroom, and meow again, and I know to get up from my desk and turn on the faucet just enough to give her a lovely and refreshing drink. But this was during the boil-water order, so I wouldn’t turn on the faucet. I briefly tried to dribble bottled water next to the faucet, and Isis gave me a contemptuous look that said, You know better than that. I demand while I imbibe. It’s true: I usually turn on the faucet and give her privacy for a couple of minutes. So the bottled water was unacceptable and I refused to let her drink out of the faucet and so she’s giving me some cat-itude right here. 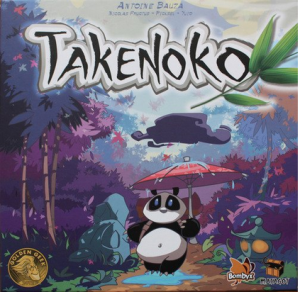 And finally, we have a new favorite game: Takenoko. Look at this adorable, adorable panda bear. I’ve noticed that the aesthetics of the games really enhances are enjoyment. Weird, maybe, but true. Like I love the artwork of Sleeping Queens, too. And there’s another cute game I haven’t reviewed yet, so that’s on the list to do. I’ve said before that Cute W is a huge fan of complicated, strategy-not-luck games, and that’s not Takenoko. There’s strategy, yes, but there’s plenty of luck involved, too. This game really looks more complicated than it is. Basically, the gardener is growing bamboo for the panda to eat, and the players all participate in creating the garden by laying down plots of land, growing the bamboo by moving the gardener around, and feeding the panda bamboo by moving the panda around the garden plots. You draw cards with a variety of objectives based on these actions, and different objectives score a different number of points. There’s quite a bit of luck involved, because some objective cards are better than others, the garden plots are drawn randomly, and, because it’s a garden, weather is a factor, too. But there’s enough going on that it keeps things interesting, and you can certainly use plenty of strategy, too. And by “you,” I mean Cute W, because of course he remembers things like how many different plots of each color there are and which objective cards haven’t been played yet. I just don’t keep track of it. But I like how, when one of us makes the panda eat, we make little “nom, nom, nom” noises as if he’s really savoring the bamboo. We all get different things out of these games. 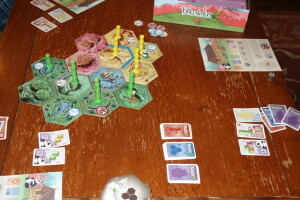 A game of Takenoko takes about 45 minutes. The manufacturer recommends it for ages 13 and up, but I’d put it at younger, maybe ages 9 and up, assuming that your 9-year-old is a smarty-pants.